Heavy Duty Tung Oil based Teak Oil. 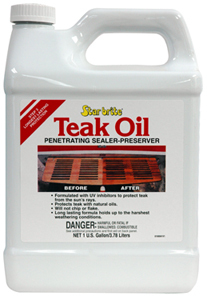 Seals and protects teak and other fine woods with UV inhibitors to resist weathering. Special formula penetrates deep into teak wood surface to preserve wood. Fast drying formula. Apply multiple coats to make teak shine and finish last.